We’ve counted down the top 10 moments in each Ivy school’s history as part of our Ivy League at 60 retrospective. We Cornell did last because they are the Men of Last Call. Over the course of writing the most memorable moments in Cornell basketball history, I’ve tried to lay out a story – the path a school with no discernible basketball pedigree took to becoming the top story of the biggest event in all of college sports. Eventually, a novice group of freshmen with potential became young guns taking the league by storm and finished as savvy veterans playing with a purpose. After two straight defeats in the NCAA Tournament, the novelty of seeing the Cornell logo on college basketball’s biggest stage had worn off for the eight-man senior class. It was the last chance for the group who turned around Cornell basketball to become the first Ivy League team since 1998 to win an NCAA Tournament game. It was a mindset that had permeated throughout the whole team even before the season began. “Obviously the first goal is to win the league and make it three in a row and then hopefully get to the tournament again and definitely win a game or two, Sweet 16 at least, and see where we go from there.” freshman Peter McMillan said in Nov. 2009. “I definitely think we can win a lot of NCAA Tournament games, get kinda far, you know, make some noise,” fellow freshman Errick Peck added. The 2009 title is like the forgotten child of Cornell’s mini-dynasty – not as historic as the first and not as successful as last. Everyone knows where this countdown is heading. Cornell had to win a lot of games to build itself up to winning three straight Ivy League championships and reach the Sweet 16. Some stand out more than others. 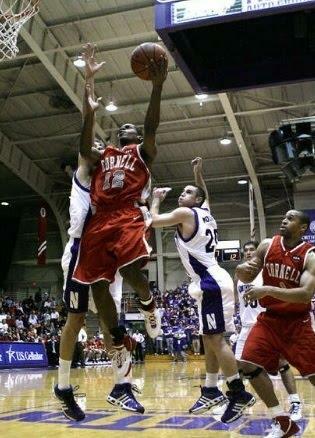 We talked about beating Northwestern in 2006; a win that showed the rest of the league Cornell was for real. Next, Cornell had to make that statement to the rest of the country. Their chance – the 2009 MSG Holiday Festival. We’re counting down the top 10 moments in each Ivy school’s history as part of our Ivy League at 60 retrospective. Cornell is next because Jeff Foote is the man. Cornellians are no stranger to professional basketball. Since 1995, more than 25 Big Red basketball alumni have extended their career to the professional ranks. Cornellians are also no stranger to the NBA. Bryan Colangelo (’87) is the former general manager of the Phoenix Suns and Toronto Raptors. Larry Tanenbaum (’68) spearheaded the effort to bring an NBA franchise to Toronto. Steve Belkin (’69) is a former owner of the Atlanta Hawks who sold his 30 percent stake in 2010. Mark Tatum (’91) is currently the deputy commissioner and chief operating officer of the NBA, commissioner Adam Silver’s No. 2. Big Red alumni playing in the NBA is a different story. 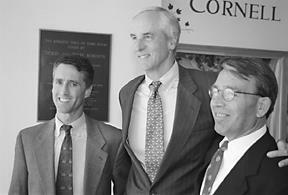 In the league’s early years, Cornell had somewhat of a presence. Shortly after the NBA’s inaugural 1946-47 season, Nat Militzok, Ed Peterson, and Gene Berce were all drafted by the New York Knicks. But recent NBA history wasn’t as kind to basketball players from Cornell. In the past 50 years, 3,071 men have suited up for an NBA game, only one of those men played college basketball at Cornell. Louis Dale drives for a layup in his first collegiate game, a 64-61 win over Northwestern. It didn’t happen overnight for Steve Donahue, but a steady stream of talent was starting to come into the program, and results were slowly showing on the court. In 2005, Cornell went 8-6 in conference play, its first winning record in the Ivy League since 1993. The Red followed its second-place Ivy finish with a third-place finish in 2006, the first back-to-back top-half league finishes since the 1988 and 1989 campaigns. 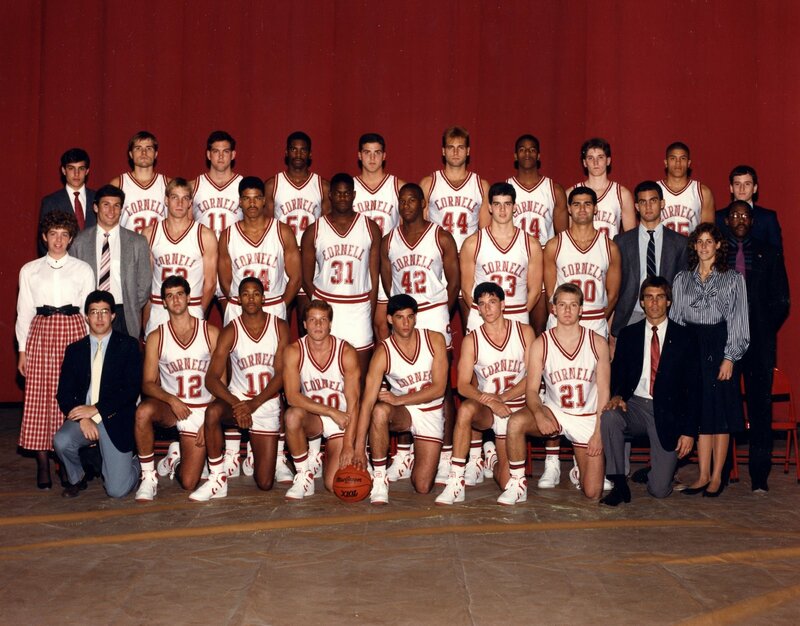 The 1987-88 Cornell Big Red. We’re counting down the top 10 moments in each Ivy school’s history as part of our Ivy League at 60 retrospective. Cornell is next because nothing compares 2 Cornell. Ivy League schools have been competing in basketball for a long time. Cornell, Columbia, Princeton, Yale and Harvard have met on the hardwood since 1901. Penn joined in 1903, Dartmouth in 1911, and finally, Brown in 1953. For the first 53 years, these school competed in what was known as the Eastern Intercollegiate Basketball League. Results were pretty even. Penn led all schools with 13 titles, followed by Columbia with 12, and Dartmouth with nine. Cornell won the league four times – in 1913, 1914, 1924, and 1954. We’re counting down the top 10 moments in each Ivy school’s history as part of our Ivy League at 60 retrospective. Cornell is next because once upon a time, Barton Hall was a buzzer-beater biosphere. Arguably, the most impressive of them all is what occurred on Jan. 16, 1965. There’s plenty of healthy debate over who is the best team in Ivy League history. The 1979 Penn team? One of Jim McMillian’s Columbia teams? The 1998 Princeton team? 2010 Cornell? Sam MacNeil’s 1965 Cornell team did finish 19-5, but will never be in this conversation. 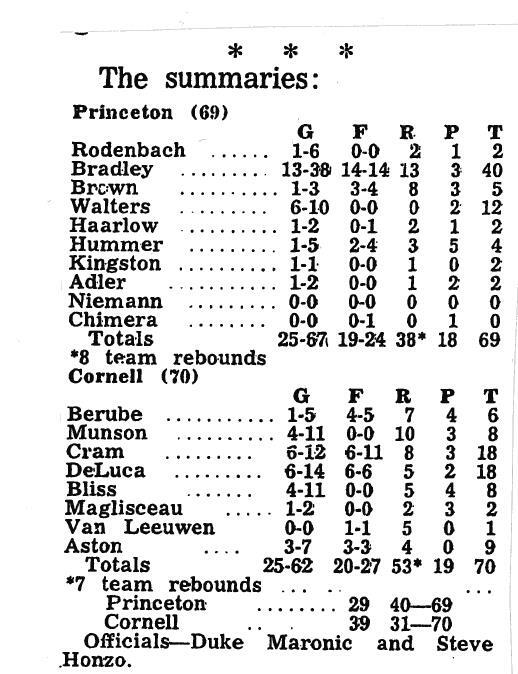 On the other hand, the ‘65 Princeton team, led by future Hall of Famer Bill Bradley might start and end the debate. 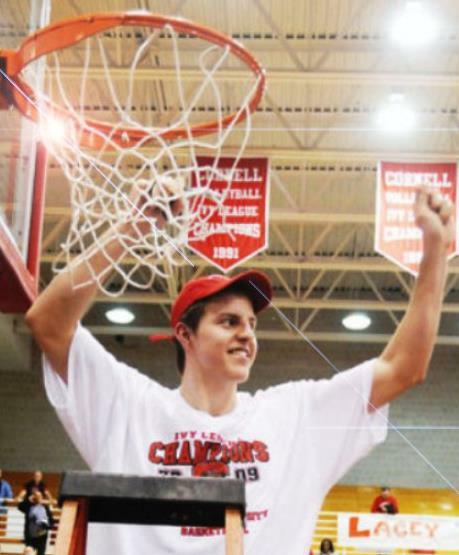 It won’t be a surprise to anyone that a good portion of the top 10 moments in Cornell basketball history will be dedicated to the three-year run from 2008 through 2010 that culminated in its first ever Sweet Sixteen berth. A lot had to happen and even more had to go right for a school with no discernable basketball pedigree to overtake the highest stage in the conference, and at times the nation. The stone that started the ripple effect was bringing the architect of the transformation to Ithaca, New York. It was the fall of 2000 and the Cornell men’s basketball team was beginning the new century moving in the wrong direction. It had been 11 seasons since its last conference title in 1988, and the program had only finished with a winning record twice. The path toward relevance again took a detour when after four seasons and a 45-60 record, head coach Scott Thompson was forced to resign to focus on his battle with colon cancer. Whoever would take his place would inherit a team that after being picked to finished third in the league managed only a 3-11 conference record, good for dead last. That man was 38-year-old Steve Donahue, who was officially hired on Sept. 6, 2000. It would have been a nice Cinderella story if Coach D, with a fresh motion offense, a few of his patented whistles, and some elbow grease took this group from worst to first immediately, but we all know it didn’t go down that way.